Pictured above are the ruins of the Naumkeag Steam Cotton Mills Co. and the street running down in front of the Mills is Congress Street. These are the mills that Elmina worked at before she started raising her family. There were homes all along Congress Street and the Pelletier family had lived on the right hand side as viewed in this picture. The "Great Salem Fire" of 1914 started at 1:37 PM, following a long June dry spell. The date was June 25th and from all reports it started at the Korn Leather Factory at 57 Boston Street. In this factory they were manufacturing what is known as the tip finish for patent leather, a compound of flammable materials. The fire started in a shed that was located on the street level where acetone, amalacitate, alcohol and large quantities of celluloid were stored. This fire burned 253 acres, 1,376 buildings, the territory covered being 1 1/2 miles long by 1/2 mile wide. Resulting in almost 20,000 people homeless and 10,000 out of work. This fire was a turning point in the life of the Pelletier family because they were among the thousands of families that lost everything as a result. They had lived on Congress Street in the French District of Salem, and Mary 11yrs and Joseph 9yrs had gone to the French speaking school of St Joseph's and knew very little English. This lack of knowledge of the English language would be a concern in just a few short months when the family relocated to Lynn, MA, but I am getting ahead of myself! At the time of the fire Alice was 6yrs and Anna was 2yrs old. 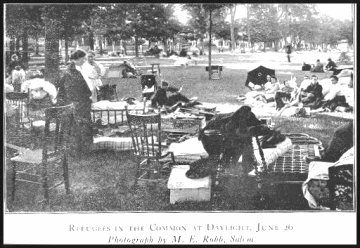 The Pelletier family was evacuated to the Salem Commons, where they stayed until the Tent City was set up by the Army at Forest River Park. This park is located near the present day Salem State College at the end of Lafayette Street. Check the Salem Scenes page for views of and around this Park as it is today. 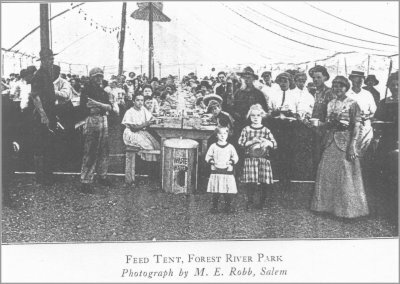 The family lived at Forest River Park for 1 1/2 to 2 months. From the stories that Mary told her family, as we were growing up, the children enjoyed there stay at the park. They had made friends with the military men that were running the Mess Tent and were able to go in the back of the tent and get a snack any time of the day. Seeing it was during the summer months that they lived there I am sure they took advantage of the beaches that are located at the park. The Pelletier's moved to Lynn in the Fall of 1914 and Mary and Joseph entered there first none French speaking school. Elmina and Cyrias attempted to have them enrolled at the St Jean's School which was the French speaking Parrish School in Lynn. Their attempts failed because there was such a large number of French children that were displaced because of the fire there was no room left at the school. They ended up at the Ingalls School, which was a public elementary school close to where they lived. They had a very difficult time with the transition and never did finish there education, but during these times few children did. Mary was out working, to help support the family, by the time she was 13 years of age. Lynn was a thriving community with a large downtown shopping area, containing many clothing, 5 & 10 Cent, Shoe and General Merchandise Stores. 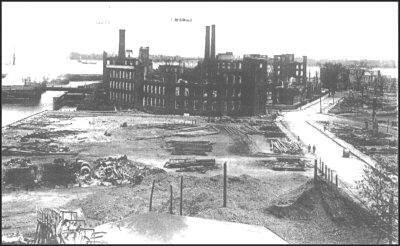 For Industry there were three plants of the General Electric Co. and numerous leather and shoe manufacturing shops. There were also at least nine theaters located in or near the downtown area. Above is the home that the Pelletier family moved into when they first arrived in Lynn, MA. 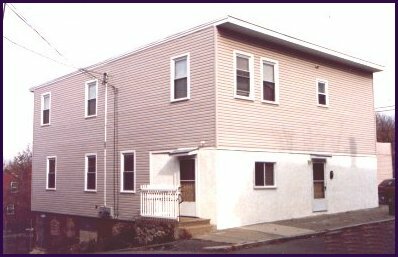 When they were living in this home there was a third floor, which has since been removed. The way entry was gained to there apartment was via a staircase that was attached to the left hand side of the building, which is no longer there. The first floor which is now white was a grocery store and on the right hand side of this building there was a bakery. There were two apartments located on the third floor and one shared toilet area with no bath or shower in this area. There was a single soap stone sink in the kitchen and an oil fired black cast iron stove which was used for all there cooking and heating of water. They had an ice box for keeping items from spoiling that was used during the summer months. During the winter months there was a box attached to one of their kitchen windows where items could be stored to keep them cold. Baths would be taken in a large tub that was placed on the kitchen floor and water would be heated on the stove. Favorite pastime of Elmina Pelletier was sitting in her rocking chair and listening to the soap operas of the day on the radio. She would also read through the daily news paper using her good ole magnifying glass, similar to the one pictured with Sherlock Homes. Cyrias would walk down to the local pub and have a cold one and then drop over to his daughter Mary's house and attempt to get her to sit down and play cards with him. His favorite card game was Cribbage....and he didn't like to lose!